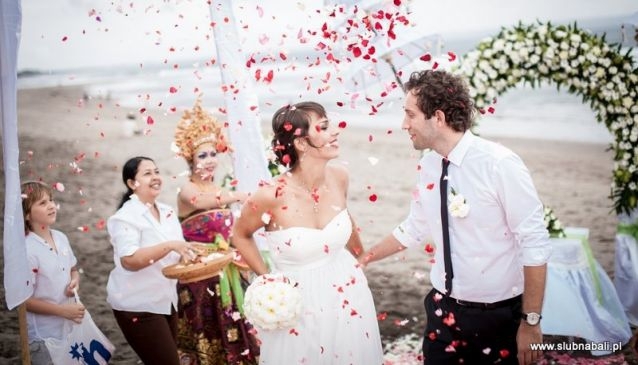 Bali Happy Events organize wedding ceremonies, honeymoon tours, traditional holidays and tours in Bali. They are proud and happy to have had the opportunity to organize that Special Day for so many couples! Getting married in Bali is legal. It means you'll receive legal wedding documents issued by the local civil registry office as well as the church. Based on these you may proceed in your country with registration of your marriage. Thanks to this solution you will enjoy your dream tropical wedding on the spot you'll choose: on the beach, in the villa or in front of the ricefields! Bali Happy Events are pleased to invite you for your wedding in Bali! Getting married here is not just getingt married! There is a difference! Bali is the island of gods, isn't it? We will be more than happy to organize not only your wedding in Bali, but also your stay: accommodation and tours. Please go through the information on our website and do not hesitate to contact us!